Photomontage of a group of giant frogs next to a pond. 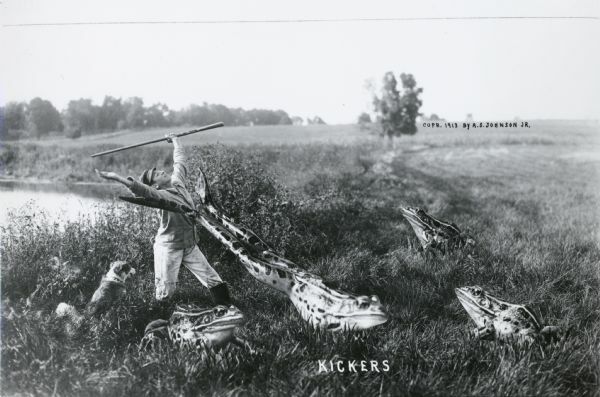 One of the frogs is kicking a boy's arms, causing them to fly upwards. A dog is sitting by the feet of the boy. A pond is visible behind them. The word, "Kickers," appears in white text at the bottom. This photograph would have been used to create a postcard. Refer to Image ID: 44636 for a similar version of this print, before the frogs have been added. Note, however, that the pose of the boy and the dog are slightly different in this final version. A line cuts across the sky, perhaps for Johnson to mark where to crop the image to match conventional postcard dimensions. Boy and dog in photo identified as "Elmer Vanderkin and dog Boozer." Waupun catalog no. P125. Made from print loaned by the Waupun Heritage Museum.